Whether ham is your favorite Easter treat or a regular indulgence, it isn't one of the healthiest meat options. 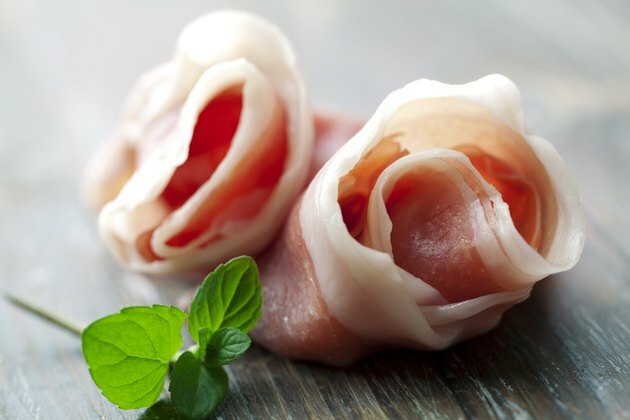 Ham does provide a lot of protein and some vitamins and minerals, but it is also high in both sodium and fat. When you do decide to eat ham, opt for the healthier extra lean version over the regular version, since this will save you both fat and calories. A 3-ounce serving of regular roasted boneless ham provides 151 calories, 19.2 grams of protein and 7.7 grams of fat, including 2.7 grams of saturated fat and 50 milligrams of cholesterol. This is 38 percent of the daily value for protein, 12 percent of the DV for fat, 14 percent of the DV for saturated fat and 17 percent of the DV for cholesterol if you follow a 2,000-calorie diet. Opting for extra-lean ham instead will save you 28 calories, 3 grams of fat, 1.2 grams of saturated fat and 5 milligrams of cholesterol. Each serving of ham provides you with 41 percent of the DV for thiamine, 16 percent of the DV for riboflavin, 26 percent of the DV for niacin, 13 percent of the DV for vitamin B-6 and 10 percent of the DV for vitamin B-12. These B vitamins are essential for keeping your liver, skin, eyes and hair healthy and for turning the food you eat into energy for your body. Ham also contains 24 percent of the DV for phosphorus, 10 percent of the DV for potassium and 14 percent of the DV for zinc in each serving. You need phosphorus for forming DNA, potassium for proper nerve and muscle function and zinc for a healthy immune system. Ham is very high in sodium, with 1,275 milligrams in a 3-ounce serving. This is almost all of the 1,500-milligram recommended daily limit for people with high blood pressure and over half of the 2,300-milligram limit recommended for healthy people. Consuming too much sodium increases your risk for high blood pressure and heart disease. Processed meats, like ham, also increase your risk for numerous health problems. A study published in "Current Atherosclerosis Reports" in December 2012 found that consumption of these meats was linked to a higher risk of heart disease and type-2 diabetes. Another study, published in "PLOS Medicine" in 2007, found that eating processed meats increases your risk for colon and lung cancer. You'd be better off choosing fish, skinless chicken or vegetarian sources of protein.